Fill in your details below and we will let you know within 24 hours if we can get Fury of Dracula (4th Edition) to you with haste! 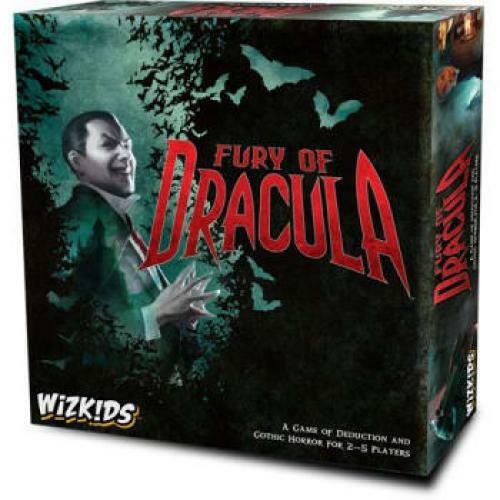 The most notorious vampire of all rises again in this third edition of Fury of Dracula, a board game of deduction and gothic horror based on Bram Stoker's classic novel. One player takes control of the legendary Count Dracula as he stealthily crosses Victorian-era Europe, spreading his diabolical vampirism everywhere he goes. Up to four other players govern Mina Harker and her determined companions as they try to locate and destroy the fiendish Count before he plunges Europe into horrific darkness. But in this heated game of cat and mouse, the hunted prey may also be preying on his hunters. Any day's travel might bring the hunters to Dracula's location. On any night the Count may attack.